The iFish Series of Apps continues to grow with the release of iFish Arkansas, iFish Oregon, iFish Oklahoma, iFish Louisiana and iFish Indiana. These apps are jam packed with depth info, maps, hotspots, boat launch locations, tips, tricks and so much more. We’re over halfway through releasing the lower 48 state-specific iFish Apps and will have the entire nation covered by Christmas. Nearly 150 Depth Chart Maps were added into the iFish USA APP within the state of Montana! Now not only do you know where to fish, you can view lake depths before you head out & save the maps to your device for offline viewing. This brings our USA depth chart total to over 9,100 detailed lake maps and as always we’re constantly adding new data as it becomes available, so this number will continue to grow. Watch for iFish Montana Coming Soon in the App Store and Google Play. 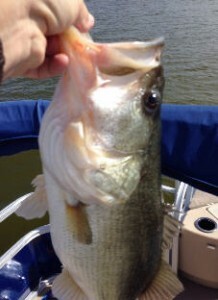 Check out this Brag that came through the iFish Florida App submitted by Tom Spade! Tom caught this beauty fish on an overcast day in 16 FOW. Awesome, thanks for sharing! With cooler temperatures, calm waters and fewer bugs, autumn is a great time for fishing. As anglers load up their trusty tackle boxes for their next fishing trip, they can also turn to apps on their smartphones to help them hook a keeper. Before hitting the water, fishermen can get great tips to guide them to the best nearby lakes, ponds or reservoirs through Apps for Anglers’ iFish app series. With individual apps for more than 20 states across the nation, iFish provides advice on the best fishing times and how-to fishing techniques as well as access to state licensing and regulation information. For experts, there are also solunar fishing calendars, a species reference for keeping track of the catch and feedback shared by fellow expert anglers. Fishermen of all levels can appreciate the HotSpots feature that allows users to mark, view and share their favorite spots. When choosing a lake to fish, depth is something most fishermen take into consideration. What if you could know the depth and even see a map before you head out? The iFish Minnesota App has over 2,400 depth charts attached to Minnesota Lakes. Where available, depth maps can be viewed directly at a lake within the app, or download them for offline viewing. What states are next for iFish? Currently we’re working on iFish Wyoming, iFish West Virginia, iFish Vermont, iFish Idaho, iFish Kansas & iFish Utah! Watch for these 6 state-specific apps in the coming weeks up in The App & Google Play Stores!